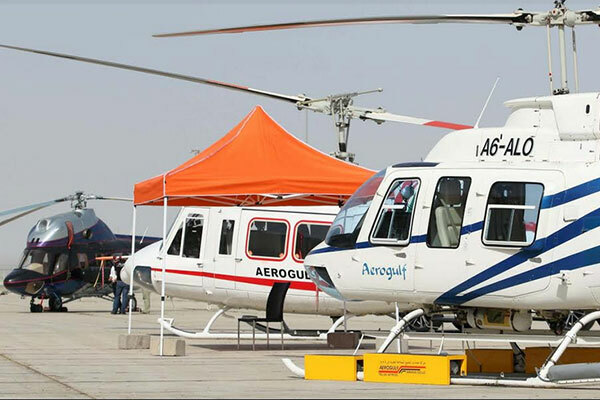 The second day of the of Dubai HeliShow 2018, the biennial International Helicopter Technology and Operations Exhibition, displayed an array of latest helicopter technologies, amidst wide international participation. The event, which is hosted at the E2 Royal Pavilion, Al Maktoum International Airport, Dubai South, continues to be an ideal platform to sign strategic deals and establish strong partnerships between companies in the field of helicopter technology and related sectors, while highlighting their wide range of innovative products and technologies, reflecting the massive growth of the helicopter industry. The current edition of the Dubai HeliShow features a series of in-depth discussions on main issues affecting the future of the helicopter industry on the local and international levels, in the presence of exhibitors, decision makers, government and defence officials, besides customers, and manufacturers from the industry. These meaningful discussions also highlight the industry’s current and emerging challenges and explore new trends, prospects for fruitful partnerships and opportunities for growth, in line with the rapid technological developments in commercial, civil and military helicopter sectors. Ahmad Abulhoul, managing director, Domus Group, organizers of Dubai HeliShow 2018, said: “The event has once again succeeded in providing an ideal opportunity for all national, regional and international stakeholders to sign new deals, driving further development of this vital sector, which is considered today as a main contributor in the achievement of the goals of economic diversification. Abulhoul added: “The second day’s discussions have led to very important outputs in the presence of regional and international leaders, who are showcasing their latest innovations related to helicopter technology. We are pleased with the wide participation in the current edition, which reaffirms the UAE’s status as a leading international hub for aviation. 'Helicopter Technology and Operations' and 'Military and Homeland Security', the two exclusive three-day conferences being held during Dubai HeliShow 2018, continue on the second day to discuss the latest developments in the field of helicopter technology, highlighting opportunities and challenges within the promising sector, with the participation of pioneers and decision-makers from all over the world. Both forums focus on raising awareness through featuring a vast range of topics and trends that from the future of helicopter industry, including how to empower police forces with Internet of Things (IoT) tools; the role of women in homeland security; application of robotics in policing and helicopter; tackling new patterns in narco-terrorism by integrating intelligence, forensics and response operations; best practices to boost joint inter-agency cooperation between armed forces and homeland security agencies among many others. The biennial Dubai HeliShow will conclude its current edition with the Dubai HeliShow Awards ceremony to recognize the achievements and innovations shown by visionary organizations that are pushing boundaries in the sector. The awards recognize contributions of the leading organizations in the field of development of Maintenance, Repair and Overhaul, MRO, hubs; Command, Control, Communications Computers, Intelligence, Surveillance and Reconnaissance (C4ISR); cyber defence and electronic warfare capabilities; comprehensive homeland security programmes; futuristic vertical take-off and landing, VTOL, and unmanned systems; multi-role helicopters for joint search and rescue operations and development of integrated helipad and heliport infrastructure to meet the demands of EXPO 2020 and beyond.